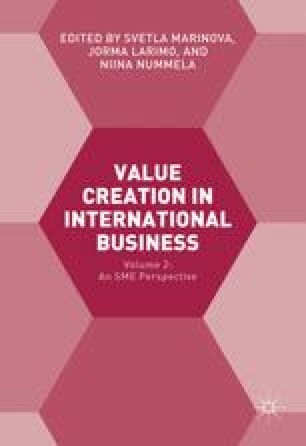 When discussing the role of value creation in international business, the meanings and interpretations of value are essential in understanding its contextual manifestations. Somehow, it seems we know what value means, but if you try to use it in different processes and contexts, in relation to diverse actors, one might be surprised by the various interpretations given to it. Some equate value with the monetary equivalence of what people do or buy; others interpret it in a much broader sense as merit or worth, which can be either tangible or intangible, yet hard to define. Often, authors assume that either the reader knows what value is and discuss what affects it or how it is created, or simply explore it in a specific setting. Economics, accounting, strategic management, marketing, sociology, and various other academic disciplines have developed their specific interpretations and models of value that are embedded in the perceptions of the worth of subject matter (for a review of conceptualizations of value in relevant disciplines see Ahen 2015: 83–86). Jorma Larimo and Niina Nummela gratefully acknowledge the financial support of the Academy of Finland to their research project on ‘Value Creation in International Growth’ (Project number: 250613). The editors would like to thank all the authors for their contribution to this book. Integrated Reporting Council (IIRC). (2013). The international IR framework. http://integratedreporting.org/wp-content/uploads/2013/12/13-12-08-THE-INTERNATIONAL-IR-FRAMEWORK-2-1.pdf. Accessed 26 Dec 2015.